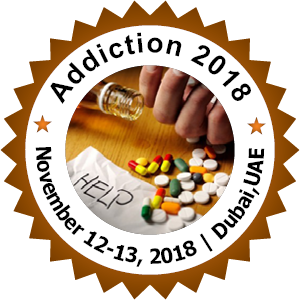 Addiction 2018 provides better leading speakers, researchers, academic scientists and research scholars to exchange and share their experiences and ideas about Addiction and Psychiatry. It can also provide a better platform for practitioners, researchers and educators to present and discuss the most recent innovations, trends, as well as practical challenges encountered and solutions adopted in the fields of neuroscience, psychology, public health, internal medicine, psychiatry, social work, treatment, and prevention. Addiction and psychiatry is a type of brain disease which involves the treatment of individual who live with chemical dependencies such as alcohol, nicotine drugs, disorders involving legal, illegal and other addictive substances. The organizing committee is gearing up for an informative conference program including plenary lectures, symposia, workshops on a variety of topics, poster presentations and various programs for participants from all over the world.